Pop Song Searching Got You Down? Read On. Over the years, I’ve found it harder and harder to locate “appropriate” songs to use with my teens clients. Back in the day there were gems like “What Makes You Beautiful” by One Direction and “Count On Me” by Bruno Mars. So simple to play, so catchy and so popular. I have to admit that these days I’m pretty disappointed by some of the music out there. It’s tough because as music therapists we want to use songs that are clients are into, but we also want to respect the rules of facilities where we work (and they might not be okay with us using songs with curse words and inappropriate themes). So, I have done a lot of work and research in this area. It’s kind of my passion. In all of the teen resources I offer (the Tuneful Teens E-Books and the Tune In To Teens E-Course), I include a Pop Song Hot List. As a bonus, I also added a list of Positive Songs for Therapy. Some of those “oldies but goodies” like Brave” by Sara Bareilles and “Can’t Stop the Feeling” by JT can still be used effectively in our sessions even though they were released a few years ago. Keep in mind that these lists are just a starting point! In both the Tuneful Teens E-Books and the Tune In To Teens E-Course, you’ll see I stress the importance of using client preferred music (this is especially critical when working with teens). 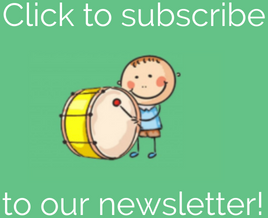 I share why this is so important and give multiple creative ways that you can determine the musical preferences of your clients. 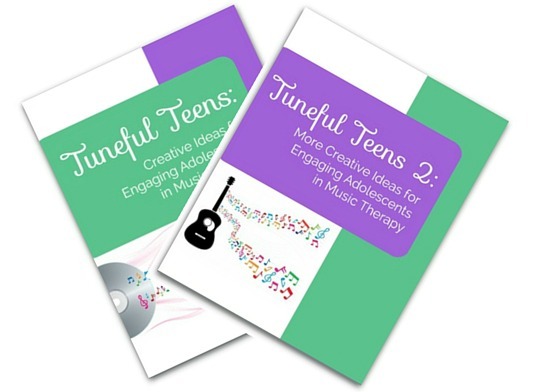 If you’re feeling stuck and a little unsure of what music to use with your teen clients, check out the Tuneful Teens E-Book series (it’s sold over 2,500 copies!) 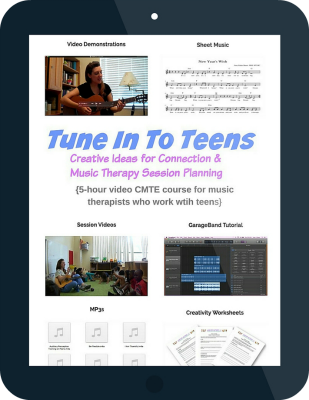 and the Tune In To Teens E-Course (it’s approved by CBMT for 5 credits). E-Course participants who’ve completed the course feel ready to step into their teen sessions with confidence, knowing exactly what music to use. 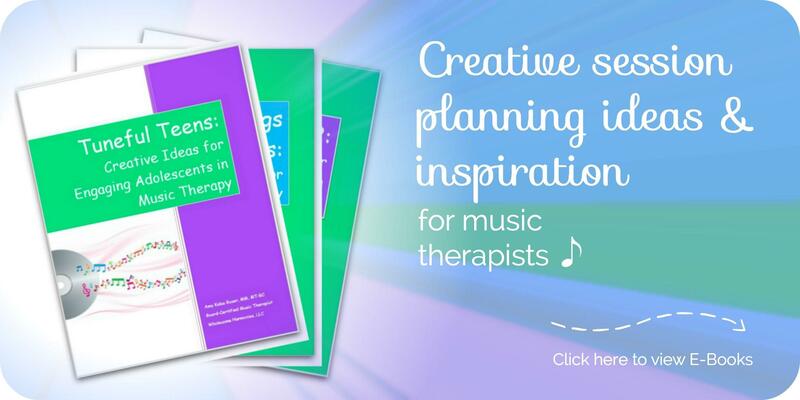 I’m kinda passionate about my work with teens AND about helping other music therapists who might be struggling with session planning. I’d for you to check out the E-Resources that are available to see where we can inspire you to feel more creative, more prepared and more confident.